Dramatic ice formations will ignite your imagination as you search the landscape for the wildlife that calls it home. Explore Buenos Aires and Ushuaia, with a convenient charter flight in between, before embarking on the cruise portion of your once-in-a-lifetime adventure. 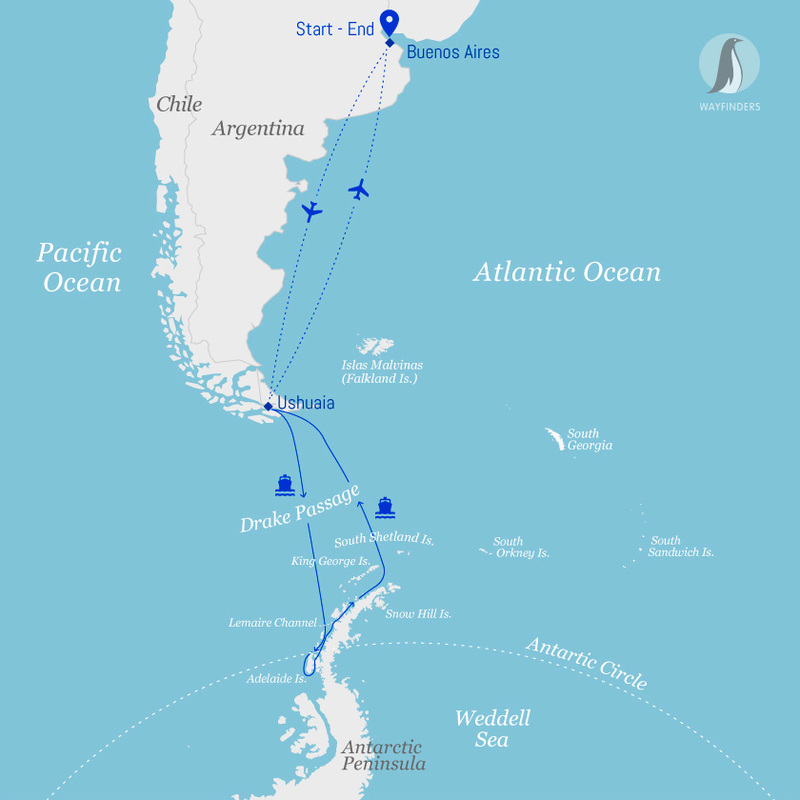 Not only does this expedition include the most in-depth exploration of the Antarctic Peninsula, but it also offers the opportunity to venture farther south across the Antarctic Circle. As you head toward a milestone that few travelers reach, you’ll feel as if you’re in a world without borders, sailing across an endless stretch of sea dotted with ice. Dramatic ice formations will ignite your imagination as you search the landscape for the wildlife that calls it home. Whether it’s humpback whales alongside the ship, a leopard seal diving beneath your Zodiac, penguins sliding off an iceberg into crystal waters, or a giant petrel soaring above cracking sea ice, you’ll experience a sensory overload in Antarctica like you’ve never felt before. You may arrive in Buenos Aires at any time during Day 1 of your itinerary. Upon arriving in this splendid city, known for its soaring architecture and rich European heritage, you will independently transfer to the group hotel (pre-night hotel included). After breakfast at the hotel, the group will transfer to the airport and board our private charter flight to Ushuaia, Argentina. Upon arrival, you will have a little time to explore this quaint port town before heading to the pier. Embarkation will occur in the late afternoon, after which your vessel will sail down the historic Beagle Channel. This famous channel transects the Tierra del Fuego archipelago in the extreme south of South America. Expect an air of anticipation as you depart—the next time you’ll see land you’ll be in the world’s most southern continent! The waters of the Drake Passage are unpredictable, so hope for clear skies and a calm ocean. You’ll have plenty of time to gaze out at the sea, get to know your fellow shipmates and chat with your Expedition Team. You will spend this time preparing for the exciting days ahead, with numerous educational and informative lectures presented by your Expedition Team. You’ll learn about everything from safety procedures to the history of whaling in Antarctica. With the Drake Passage left in our wake, we make our approach to Antarctica. Get your cameras ready as the continent’s coastline makes its first appearance, signaling the start of your adventure in the realm of the Antarctic. You’ll see plentiful floating icebergs and be fixated on the ocean surface as curious whales spout and breach before your eyes. As exciting as it can be from on board the ship, your true exploration occurs when you disembark and set foot on the White Continent. There are several potential landing sites that we may visit, including Neko Harbor, Orne Harbour or Paradise Harbour. Although weather dictates which specific landing sites we can visit, each one presents a new collection of wildlife and natural attractions. Your days will be busy spotting wildlife and being mesmerized by the beauty of Antarctica. 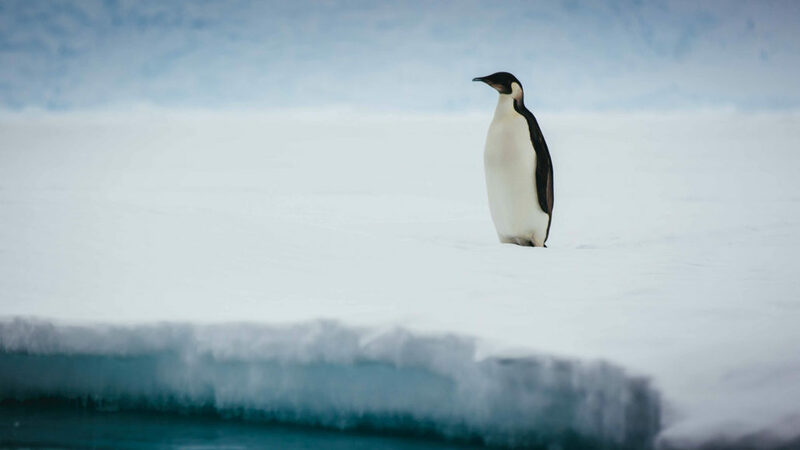 Watching penguins waddling on the beach and listening to the crackling and crumbling sounds of icebergs and glaciers will become your daily entertainment, while kayaking with whales and polar camping are optional activities available on select voyages (at an extra cost). Crossing the Antarctic Circle is an impressive achievement, as most expeditions to the Antarctic Peninsula do not reach 66°33′ S. You and your shipmates will celebrate in style with a well-earned glass of champagne! As you toast the first explorers who ventured this far south, you can take pride in knowing you’ve made it to a part of the world visited by very few people. This is raw Antarctica, home of the midnight sun, Weddell seals and some of the most magical, odd ice formations you’ll see anywhere on the continent. By now, your knowledge of Adélie, chinstrap and gentoo penguins will be matched by your ability to differentiate between a leopard, fur or Weddell seal. Terms like bergy bits and pancake ice will seem normal, yet there are still many tales to be told. As you head north, Zodiac excursions will fill your days, and your Expedition Team will continue offering presentations while giving you time to reflect on everything you’ve experienced. As you recross the Drake, Antarctica fades away, leaving you with a collection of memories to last a lifetime. Excited conversations with your newfound friends will make the crossing fly by, regardless of weather and sea conditions. Your Expedition Team will round up its series of lectures as well, perhaps with a slideshow of the great landing sites and wildlife you’ve witnessed over the course of your voyage. We will arrive in Ushuaia in the morning, after breakfast. After disembarking, you will get a little taste of Patagonia, touring Tierra del Fuego National Park before transferring to the airport for the return group charter flight to Buenos Aires. *Twice the space of the Twin Porthole or Twin Window, with one bathroom. **Twice the space of the Twin Porthole or Twin Window, with two bathrooms. Complimentary wine with dinner on Ocean Endeavour.